There's a "new" (where's the NEW sign?) 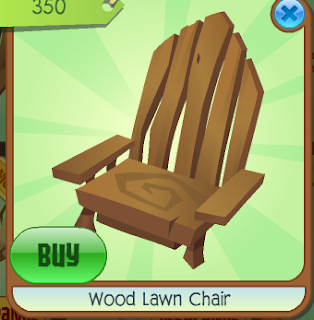 Wooden Lawn Chair in Jam-Mart Furniture! Sold for 350 gems, I think it's cool! Anyways - Members, if you think you want to make an icy den - now's your last chance! Everything - even the snowfort den - is clearance and tomorrow's the update! Tomorrow is the update. Weirdly, I saw a black and white flower in underwater Best Dressed. The thing is, these will never be released again. Could this be another "RARE"? Well that's all for today! See you tomorrow at the Summer Carnival! P.S: I'm featured on Snowyclaw's blog! Click here!